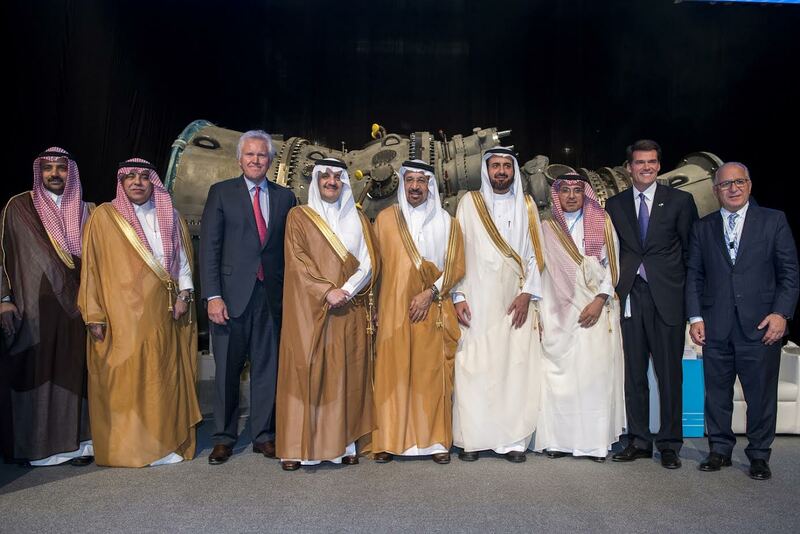 His Royal Highness Prince Saud bin Nayef bin Abdulaziz Al Saud, Governor of Eastern Province and GE’s Chairman & CEO Jeffrey Immelt with Saudi ministers and dignitaries at the Minds + Machines Saudi Arabia 2016 event held at the GE Manufacturing & Technology Center (GEMTEC), 2nd Industrial City, Dammam. Dammam, Saudi Arabia: GE Saudi Arabia today announced the roll-out of new digital industrial partnerships, technologies and initiatives supporting the goals of the country’s economic diversification and enhanced industrial productivity as outlined in the Saudi Vision 2030 at its Minds + Machines Saudi Arabia 2016 event held at the GE Manufacturing & Technology Center (GEMTEC), 2nd Industrial City, Dammam, under the patronage of HRH Prince Saud bin Nayef bin Abdulaziz Al Saud, Governor of Eastern Province. The GE Saudi Technology & Innovation Center (GE STIC) in Dhahran Techno Valley will be at the heart of the company’s ‘Industrial Internet’ roadmap to drive digital transformation of industry and expand GE’s digital footprint and capability in the country. The Center will enable Saudi customers and partners to work collaboratively with GE developers to design and develop digital solutions that will become Apps running on Predix – the world’s first and only cloud-based operating system built exclusively for industry. The Center will also focus on building digital talent across Saudi Arabia through training and skill-set development programs focusing on start-ups and entrepreneurs in the digital industrial space. GE STIC also features a newly opened state-of-the-art Data Visualization Lab. The lab will enable GE and its partners to intelligently interact with, and visualize, large quantities of Big Data, generating meaningful insights that drive productivity gains across industrial assets. This further expands the R&D and localized innovation capabilities of GE STIC, which is focused on co-creating technologies and solutions across key sectors such as power, oil & gas, aviation and water. The GE Minds + Machines Saudi Arabia 2016 featured keynote speeches by HE Eng. Khalid Al Falih, Minister of Energy, Industry & Mineral Resources; HE Dr. Majid Alkassabi, Minister of Commerce & Investment; HE Dr. Tawfig Al Rabiah, Minister of Health; GE’s Chairman & CEO Jeffrey Immelt, and GE Power President & CEO Steve Bolze. A ministerial panel discussion on ‘Digital Transformation of Industry and Saudi Vision 2030: Driving diversification and localization in the Kingdom’ was addressed by HE Eng. Khalid Al Falih, HE Dr. Majid Alkassabi, HE Dr. Tawfig Al-Rabiah and Jeffrey Immelt. A second panel discussion titled ‘Driving successful customer outcomes through the Digital Industrial ecosystem’ included valuable insights from Eng. Ziyad Al Shiha, CEO SEC, Dr. Khaled H. Biyari, CEO STC and Eng. Abdulaziz Al-Abdulkarim, VP Procurement & Supply Chain Management at Saudi Aramco. Industry break-out sessions on digital transformation of the energy value chain and the aviation sector’s digital future were also held. Partnership with Saudi Ministry of Health on Big Data, Simulation, Digital Twin, and Virtual Hospital Visualization: Supporting the goals of the Saudi Ministry of Health (MoH) to drive digitization to achieve measurable improvements in quality of patient care and cost, MoH looks forward to working with GE Digital to build the MoH Digital Capability. The Digital Capability is intended to focus on creating Predix Apps that can be considered for utilization at Saudi MoH hospitals and Primary Healthcare Clinics (PHC). GE Digital is also considering to deploy Software as a Service (SaaS) to MoH hospitals and PHCs in a manner that may cover patient experience, asset management, command center, and dose management, among others. The two entities intend to assess opportunities to collaborate on big data management as well as data visualization and modelling through virtual hospitals. GE’s Reliability and Integrity Management Solution for Saudi Aramco’s Jazan Complex: GE Oil & Gas Digital is introducing its first Asset Performance Management (APM) solution to reside on Saudi Aramco’s business network for the Aramco Jazan Complex Integrated Manufacturing Operations Management System (IMOMS). To be deployed on industrial assets, APM will support reliability and integrity of the assets and provide tools for analysis and strategy development, assuring greater operational excellence. The solution will enhance reliability and integrity to drive business and financial key performance indicators for the Jazan Complex and detailed refinery and IGCC operations. The project is being deployed through a partnership between GE and Accenture, and is the first APM refinery reference in the MENAT region set to go live in January 2018. Generalization & Optimization Center at Saudi Electricity Company (SEC) by GE: SEC has selected GE as its solutions provider to drive a nationwide digital transformation of electricity in Saudi Arabia. Accordingly, SEC and GE have established a Generation & Optimization Center (GOC), a state-of-the-art center equipped with hardware and software to monitor 16 SEC power plants. The GOC will monitor data on critical key performance indicators (KPIs) from across the power plant. The data will be turned into insights using GE’s advanced industrial software, to predict component failures in advance and to recommend optimal power plant operations, allowing the generation team to plan preventive maintenance, enhance plant availability, avoid service degradation to customers and reduce costs. Partnership with Saudi Telecom Company (STC): STC and GE have formed a strategic alliance around GE’s Industrial Internet technologies to drive accelerated growth for both companies in Saudi Arabia. STC and GE shall collaborate in line with the KSA transformation ‘Strategy of 2030’ in the area of digital transformation to drive measurable improvements in access, quality, costs, and efficiency in all industries and government services. The alliance will deliver a continuum of services from initial discovery, strategic management consulting, IoT project delivery and training; in doing so the two organizations will provide a complete end-to-end value proposition to their customers. MoU with TAQNIA: GE signed a MoU with the Saudi Technology Development & Investment Company (TAQNIA) to co-create digital industrial solutions that support the economic and industrial diversification of the Kingdom in line with Saudi Vision 2030. The two entities will co-develop industry Applications (Apps) on GE Predix. This will help establish Saudi Arabia as the region’s largest marketplace for specialized industry Apps and build a home-grown innovation ecosystem for talented Saudi nationals. They will also work together to develop cutting-edge cyber security solutions for the Saudi industrial sector. Wurldtech, a company acquired by GE that builds solutions to protect critical infrastructure from cyber-attack, will deploy advanced cyber-security solutions for the industrial environments. With a presence of over 80 years, three offices and seven facilities, Saudi Arabia accounts for the largest GE workforce in the Middle East with over 2,000 employees driving the Aviation, Healthcare, Oil & Gas, Power & Water and Transportation businesses. GE (NYSE: GE) is the world’s Digital Industrial Company, transforming industry with software–defined machines and solutions that are connected, responsive and predictive. GE is organized around a global exchange of knowledge, the “GE Store,” through which each business shares and accesses the same technology, markets, structure and intellect. Each invention further fuels innovation and application across our industrial sectors. With people, services, technology and scale, GE delivers better outcomes for customers by speaking the language of industry.